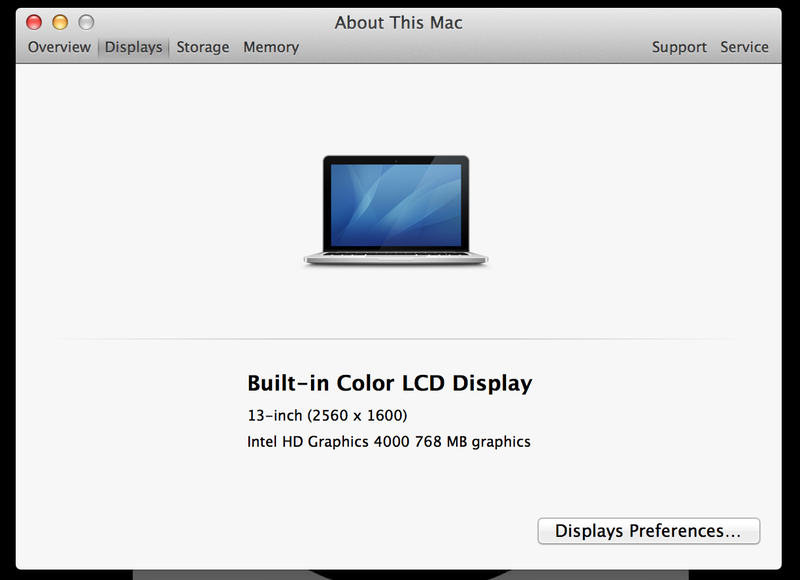 My MacBook Pro 13 inch retina has a screen resolution of 2560 × 1600. How come when I take a screenshot (Command+Shift+3 for full screen), the resolution is much higher: 3360 × 2100? The reason why your screenshot is larger than the size of your display is because with the release of Retina Display notebooks, and corresponding OS X associated updates, the screen-size "resolution" is now derived in a much different (read, complicated) manner. To keep things simple for their users, Apple now offers five different resolution settings. None of these settings offer explicit, desktop pixel densities for you to choose from. Instead, Apple asks you to select a text-size preference. Each option scales your applications and display content differently. The smaller the font, the higher, internal resolution will be rendered that will finally be scaled down to match your display's resolution. 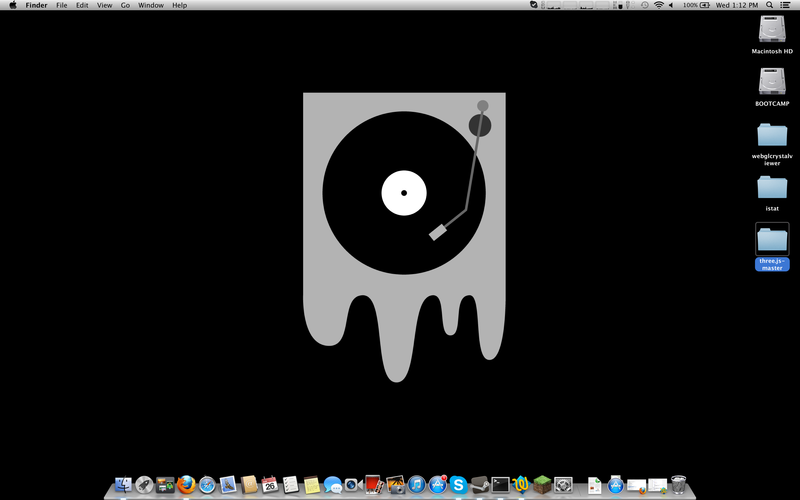 When you take a screenshot of your desktop, your image is of a different size than your display resolution because OS X is rendering a desktop that is effectively larger than your display's pixel density. If your screenshot is 3,360 x 1,800, you probably have the fourth option selected on the above display settings screen. This intermediate setting renders all non-updated applications at an effective resolution of 1,440 x 900, which is then scaled up by 2x. Retina updated applications are rendered for a display that is 3,360 x 1,800. The final 3,360 x 1,800 viewing area is finally scaled down to 2,560 × 1,600 for viewing on your display. OS X saves screenshots of your desktop at the pre-rendered resolution (3,360 x 1,800) rather than the final outputted resolution of your display hardware. Not the answer you're looking for? Browse other questions tagged macos resolution macbook-pro macbook-pro-retina or ask your own question. 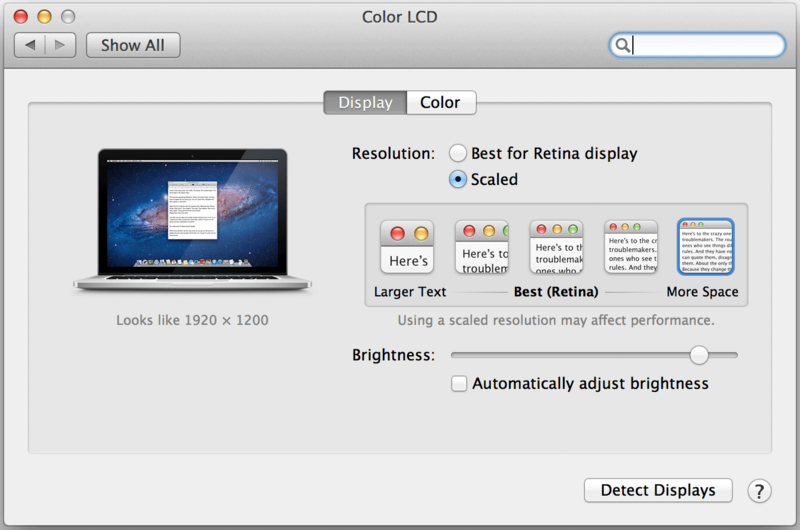 How do you stop MacBook Pro retina from switching to scaled resolution?